The Union Government, led by Prime Minister Narendra Modi, had announced the Prime Minister Ujala plan on May 1, 2015. 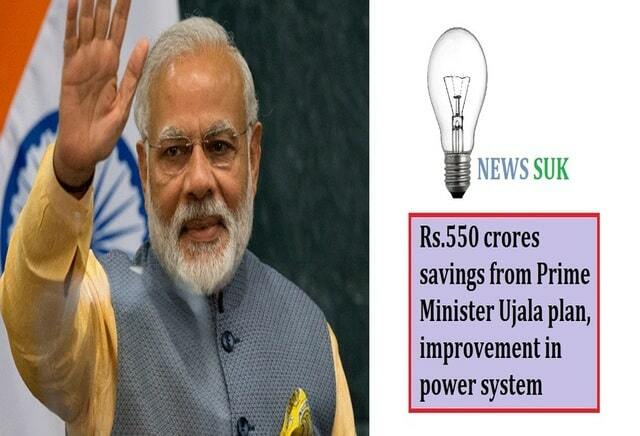 Under this, the government provides LED bulbs at a reduced price so that power can be saved. Initiating the Prime Minister Ujala plan, Modi had termed this move as historic. They told this to be the perfect means of taking the country on the path of light. In the initial one year of Prime Minister Ujala, about 9 million LED bulbs were distributed in 125 cities. This resulted in direct savings of about Rs. 550 crore. This scheme is being implemented by the Energy Enterprise Services Limited (EESL), a joint venture company of the Ministry of Power. In order to make the Prime Minister Ujala plan a success, the government distributed the LED bulbs at a very cheap rate from the market price by putting camps in place in Sultanpur district. Through this the power consumption in the country is being reduced. According to EESL, 30,72,34,251 LED bulbs have been sold till August 15, 2018. This is saving Rs 15,960 crore every year. The main reason behind the success of Prime Minister Ujala plan is that the LED bulb is 50 times more durable than the CFL compared to 8-10 times the normal incandescent bulb (bulb size bulb). Describing the Ujala scheme as the vision of Prime Minister Narendra Modi, social activist Sunder Lal Tandon has described a bold move. He said that this has increased the supply of electricity in the hours. At the same time, there have been pauses on the movement of electricity in the state. Student Deepa Verma said, “In the power bills, saving is being saved by this scheme, first one bulb had to be lit in the same room, so now it is becoming very bright in ten rooms with the same electricity. Textile businessman Manjit Singh said that the activation of the Ujala plan is proof that the market is now only getting the LED bulb. Consumer Sanjay Shukla said that power saving has also led to a decline in the number of transformers, electricity tariffs. In the success of the Prime Minister’s scheme, the state government also has a complete contribution. At the same time, businessman Kalyan Singh says that the consumption of electricity has definitely been cut. But due to the increase in electricity rates, electricity consumers are not able to get the expected profit.